So, the lonely housewife spends her days unpacking her family’s belongings in their new home. Her husband goes to work, her young sons go to school, and she stays home and watches the baby. After a few weeks in the new place, she starts hearing creepy noises, then seeing creepy things. That’s the plot to about a dozen movies I can name off the top of my head, but for our purposes, we’ll tag it as the premise of Insidious, the new horror flick from James Wan, the director of the original Saw. 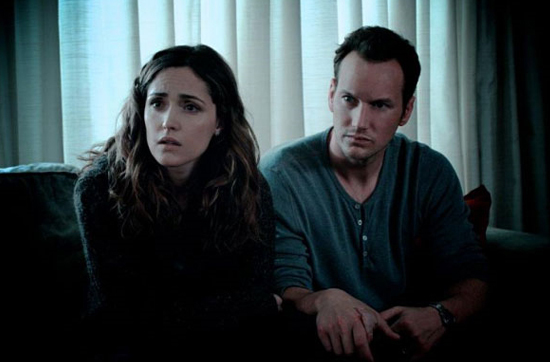 But Saw (a somewhat brilliant, very original addition to its genre) is about as far as you can get from Insidious. The scares are cheap (quick bursts of stringed music), the plot is incoherent (not at first, but eventually), and the ending is cheap. In short, you know what you’re getting right from the start of Insidious: a familiar plot, a few minor shrills, a lots of eye rolls. I do not know if it's just me or if every person else encountering difficulties with your web page. It appears as if a few of the written text on your content are running off the screen. Can somebody else please offer feedback and let me know if this is happening to them too? This could be a challenge with my web browser mainly because I've had this happen before. That's weird. It doesn't do that on my browser, and I've never had any other complaints about it. Have you tried to few the page via a different browser? Sorry for the hassle, I really do appreciate you reading the blog.